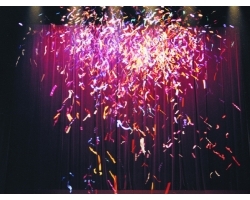 Le Maitre Chinese Confetti Cartridge Multi - Code PP498, A bang, followed by a cascade of Chinese Confetti, projected to a height of approximately 6 metres. The Chinese Confetti is made of strips of paper which twist and turn as they float slowly to the ground. Available in White, Red, Blue, Green, Orange, Pink, Black,Yellow, Red White Blue and Multi coloured. To be used in the variable angle pod.